Heath against Sir J. Barnard and Sir R. Godschall, in Error. The Lord Chief Baron of the Court of Exchequer, in the usual Manner, brought up a Writ of Error, wherein Thomas Heath is Plaintiff, and Sir John Barnard and Sir Robert Godschall are Defendants. Message to H. C. for Mr. Gildart to at tend about the Sugar Bill. To acquaint them, "That this House having now under their Consideration, the Bill, intituled, "An Act for granting a Liberty to carry Sugars, of the Growth, Produce, or Manufacture, of any of His Majesty's Sugar Colonies in America, from the said Colonies directly to Foreign Parts, in Ships built in Great Britain, and navigated according to Law;" their Lordships do desire, that they will give Leave to Richard Gildart Esquire, a Member of their House, to attend this House, as a Witness upon the said Bill." Sugar Colony Bill proceeded in. Then the Counsel as well for as against the Bill were called in. Thomas Hyam, a Quaker, was produced, and examined on his solemn Affirmation, as to the Advantages which, in his Opinion, will accrue by the Merchants being enabled to carry Sugars directly to Foreign Ports, and the Disadvantages they lie under in being obliged to land them first in this Kingdom; also in relation to the Prices of Sugar, as well to the South as North of Cape Finistre; whether the English or the French navigate cheapest? And he insisted on it, "That, by the Liberty given in this Bill, we should be able to re-gain from the French the Losses already sustained." He was further examined, as to the Difference of the Price of French and English Sugars in the Plantations; also in relation to the re-fitting of Ships, and where cheapest; and likewise, touching Insurances on Ships, and where cheapest procured. Mr. Buchannan, formerly examined, was again produced, in order to confront Mr. Hyam, with respect to his Calculations. Solomon Merrit was called, sworn, and examined, in relation to the Trade on the South of Cape Finistre (he being brought up a West India Merchant); remarked, touching the French Trade in Sugars about Ten Years ago, he being then at Marseilles, and spoke with relation to the Price of Sugars: Afterwards gave an Account of the Gain made by the French in Trade; but believed, if this Bill passed, we should be able to recover it. Then, John Ashley was also examined, upon Oath, as to the Expence in landing Goods, and re-shipping again for Exportation; and in relation to the Decrease of our Exports to Foreign Markets; which he attributed to the French beating us out of our Trade. He was likewise examined as to the Price of French Sugars in the Plantations, as well as the Price of the English; and which of the Two cheapest supplied with Negroes. He was cross-examined, as to the Dearness or Cheapness of French Muscovad Sugar; and the Charge of raising a Plantation. Next, William Beckford was produced, and examined, in the same Manner, as to the Nature of the Land in Jamaica for Sugar Plantations, and of the Sugar Works there; and insisted, "That the same would be greatly encouraged by the Merchants being enabled to send Sugar directly to Foreign Ports." He was also examined as to the Quality and Price of Sugars, and the Difference between English and French; and in relation to Damage and Wastage. And then James Knight was examined likewise, upon Oath, in relation to the same Matter; and also declared it as his Opinion, "That, if the Bill passes, it will increase the Sugar Trade;" and confirmed Mr. Hyam's Calculation, as to the Charges in landing and re-shipping of Sugars. Commons give Leave for Mr. Gildart to attend. And the Messengers sent to the House of Commons, being returned, acquainted the House, "That the Commons had given Leave to Richard Gildart Esquire, a Member of their House, to attend this House, as is desired by their Lordships Message, if he thinks fit." The Counsel were again called in. And Mr. Lloyd, on Behalf of the Petitioners against the Bill, was heard, by Way of Reply. And Mr. Gildart, attending, was sworn, and examined as to the Charges of landing and re-shipping of Sugars; whether Liverpoole be a convenient Port for making Voyages to the Northern Ports; also as to Expence of Insurance; and touching the Difference of Time in making Voyages from that Place, or from London. And then the Counsel were directed a Second Time to withdraw. Ordered, That the further Consideration of this Bill be put off to Wednesday next; and the Cause between Burke and Sir Walter Blake, appointed for that Day, to the Friday following. Dominus Cancellarius declaravit præsens Parliamentum continuandum esse usque ad et in diem Lunæ, quartum diem instantis Junii, hora undecima Auroræ, Dominis sic decernentibus. Bp. St. Asaph to preach 11th Instant. Ordered, That the Lord Bishop of St. Asaph be, and he is hereby, desired to preach before this House, at the Abbey Church, Westminster, on the 11th Day of this Instant June, being the Anniversary Thanksgiving, appointed by Authority, for His Majesty's happy Accession to the Crown. With a Bill, intituled, "An Act for the more effectual preventing of excessive and deceitful Gaming;" to which they desire the Concurrence of this House. 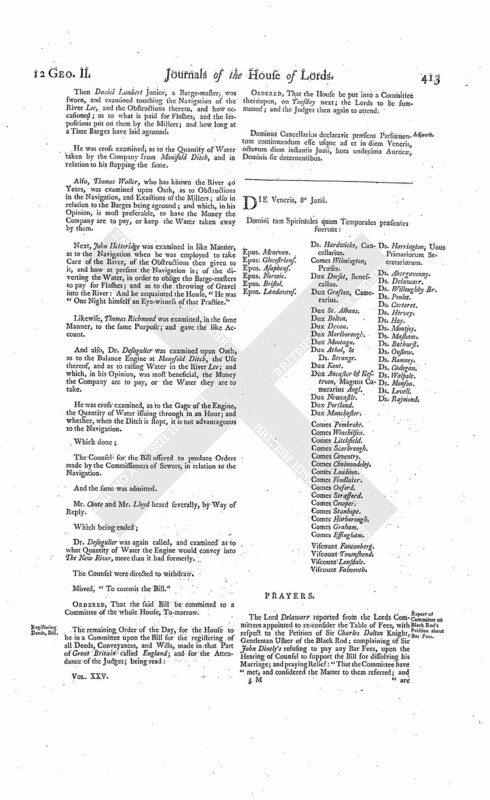 The House (according to Order) was adjourned during Pleasure, and put into a Committee upon the Bill, intituled, "An Act for granting to His Majesty the Sum of Five Hundred Thousand Pounds, out of the Sinking Fund, for the Service of the Year One Thousand Seven Hundred and Thirty-nine; and for enabling His Majesty to raise the further Sum of Five Hundred Thousand Pounds, out of the growing Produce of the said Fund; and for the further appropriating the Supplies granted in this Session of Parliament; and for giving Time for the Payment of Duties omitted to be paid for the Indentures and Contracts of Clerks and Apprentices. Motion for a Resolution concerning the Non-payment of the Money due from Spain. It was proposed, "To resolve, That the Non-payment of the Ninety-five Thousand Pounds, agreed by Treaty to be due from the Crown of Spain, as a Balance to the Crown and Subjects of Great Britain, and expressly stipulated to be paid in Money at London within Four Months after the Exchange of the Ratifications, which Time is now expired, is a manifest Infraction, on the Part of Spain, of the Convention lately concluded between the Two Crowns, a high Indignity to His Majesty, and an Injustice to the Nation. "Because we think the main Question should have been put, and passed in the Affirmative; since every Lord who spoke in the Debate agreed that it was strictly true; and we do not apprehend the least Inconvenience could possibly have arisen from it: But, on the contrary, we conceive, that the stating of the Fact of the manifest Infraction of the Convention was a necessary Foundation for the subsequent Advice of this House to His Majesty; which Advice we think the more necessary, since we are convinced, by the Experience of many Years, that the Councils of the Administration, far from procuring any Reparation or Satisfaction for the Insults and Injuries this Nation has received, have only exposed it to further Dishonour and Contempt. Dominus Cancellarius declaravit præsens Parliamentum continuandum esse usque ad et in diem Martis, quintum diem instantis Junii, hora undecima Auroræ, Dominis sic decernentibus. Accompt of the Prices of Rum and Sugar, for the Ships in the British Islands, delivered. The House being informed, "That a Person from the Victualing-office attended:"
"An Accompt of the Prices of Sugar and Rum, which have been paid by His Majesty's Subjects, either by Contract or otherwise, purchased in the several British Islands, for the Use of the British Ships, that have been there stationed for Thirty Years past; distinguishing each Year, and each Island." And the Title of the said Accompt was read. Hodie 3a vice lecta est Billa, intituled, "An Act for granting to His Majesty the Sum of Five Hundred Thousand Pounds, out of the Sinking Fund, for the Service of the Year One Thousand Seven Hundred and Thirty-nine; and for enabling His Majesty to raise the further Sum of Five Hundred Thousand Pounds, out of the growing Produce of the said Fund; and for the further appropriating the Supplies granted in this Session of Parliament; and for giving Time for the Payment of Duties omitted to be paid for the Indentures and Contracts of Clerks and Apprentices." Hodie 2a vice lecta est Billa, intituled, "An Act for the more effectual preventing of excessive and deceitful Gaming." The House (according to Order) was adjourned during Pleasure, and put into a Committee upon the Bill, intituled, "An Act to enlarge the Powers of the Commissioners for building a Bridge cross the River Thames, from The Woollstaple or thereabouts, in the Parish of St. Margaret, in the City of Westminster, to the opposite Shore, in the County of Surrey; and to enable them, by a Lottery, to raise Money, for the several Purposes therein mentioned; and to enlarge the Time for exchanging Tickets unclaimed in the last Lottery for the said Bridge; and to make Provision for the Tickets in the said Lottery, lost, burnt, or otherwise destroyed." Hodie 2a vice lecta est Billa, intituled, "An Act for the Public Registering of all Deeds, Conveyances, Wills, and other Encumbrances, that shall be made of, or that may affect, any Honours, Manors, Lands, Tenements, or Hereditaments, within that Part of Great Britain called England, wherein Public Registers are not already appointed by Act of Parliament." It was proposed, "To adjourn the further Consideration thereof for a Fortnight." And the Question being put, "Whether the further Consideration of this Bill shall be adjourned to this Day Fortnight?" Ordered, That the said Bill be committed to a Committee of the whole House, on Thursday next; the Lords to be summoned; and the Judges to attend. 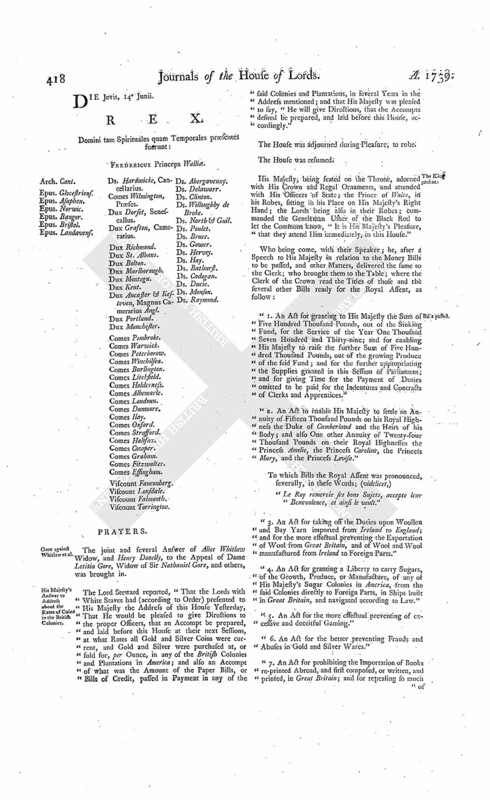 Upon reading the Petition of the Clerks of the Enrolments of the High Court of Chancery, praying, "That such Clauses in the last mentioned Bill, as empowers the Registers, appointed for the several Counties and Places therein mentioned, to enrol, enter, or register at full Length, any Deeds, Writings, or Conveyances; and which enact, "That such Enrolments, or Registry, of Deeds and Conveyances, at full Length, shall have the same Force and Effect, as if a Memorial of such enroled Deeds, Writings, or Conveyances, had been entered in the respective Register-offices," may not stand Part of the Bill; and that this House will give the Petitioners Leave to be heard, by their Counsel, against such Part of the said Bill as aforesaid, before the same shall be passed into a Law; and grant them such Relief as to their Lordships in their great Wisdom shall seem meet:"
It is Ordered, That the said Petition be referred to the Committee of the whole House to whom the said Bill stands committed; and that the Petitioners may be heard, as desired, before the said Committee, if they think fit. And Mr. Chute was heard, for several of the Petitioners against the Bill, who conceived, that they should be aggrieved thereby with respect to the Mills they had in their Possession, for Want of Water. Mr. Lloyd was heard also, for the Petitioners. The Counsel for the Bill said, "They had no Objection thereto; and that it might be more antient than the Navigation." Then Nicholas Cotterell, Steward of the Manor of Chickford, was produced, and sworn, to prove the Court Rolls of that Manor, of the 5th of Henry 5th. Next, Mr. Holmes produced a Grant of Queen Elizabeth. William Porter was called, sworn, and examined, as to the Petitioner Walton's Mill, the Number of Wheels they work, how supplied with Water; whether they have suffered any Loss, and what, for Want thereof, and by what Means. Also, Edward Fog was sworn, and examined, in the same Manner, as to the Want of Water in dry Seasons, and whether any could be spared, when, and how much. Next, Henry Watkinson was examined, in like Manner, as to the Expence Mr. Walton has been at, in keeping his Mills sit for working. And they being Powder Mills; he was cross examined, as to their being blown up, when, and how often. Next, James Pelleston was produced, sworn, and examined, as to Mr. Snell's Mills, and the Quantity of Water, the Scarcity thereof a few Years ago, and how occasioned. Likewise, Owen Mathews examined upon Oath, as to the Number of Wheels worked at the same Mills, the Quantity of Water wanted, and the Reasons of their wanting, and when. Then Edward Martin was called, and sworn; and inquired of, if he knew Manyfold Ditch, where and how situated, the Quantity of Water taken by the New River Company, what Disturbance given them; also in relation to the stopping the Ditch; and the Effect thereof. He was cross examined, as to the said Company's opening it. Next, James Jones was examined, upon Oath, in relation to the stopping the same Ditch, and when; the Dimensions thereof, and how and when enlarged; and whether any, and what, Molestation given them about stopping the same. Then Henry Durham was examined, in the same Manner, touching the said Ditch, the stopping thereof, and the Inconveniency occasioned by the Want of Water when unstopt. After which, John Hoar, who had lately surveyed the River Lee, was called, sworn, and examined, as to the Quantity of Water in the River, from Hertford to Ware; and touching the Hole, passage, or Trunk, through which the Water is conveyed for the Use of the New River Company, the Experiments which had been tried, and as to the Running of the River. He was cross examined, touching the Quantity of Water in dry Seasons. Next, John Shepherd, a Bargeman, was examined, in the same Manner, as to the Scarcity of Water in the River Ware, the stopping of Manifold Ditch, and the Effect thereof with respect to the Navigation of the River, and whether any, and what, Water can be spared. Then Robert Johnson, another Bargeman, was also examined, upon Oath, in relation to the widening Manifold Ditch a few Years ago; likewise touching the Engine set up by the said Company, for taking Water from the River Lee; what Water can be spared; how often the Barges are aground; as to stopping the said Ditch, the Length thereof, and whether any Disturbance had been given him in stopping the same. John Plummer was examined, in like Manner, as to Mr. Kent's Mills, and how affected by dry Seasons; and declared, "That they could not perform half their Work, by reason of the Company taking their Water." Then Thomas Mills, another of Mr. Kent's Millers, was examined also, upon Oath, touching the same Matter. Next, Israel Johannet, who rents the Lord Colerain's Paper Mills, was produced, sworn, and examined in relation to the Decrease of their Work, for Want of Water: And he acquainted the House, "He paid £. 60. per Annum Rent; and was hindered One Third of his Work, by the Deficiency of Water." He was cross examined, as to what he is paid for Flashes to carry off the Barges; and whether any, and what, Hills are raised in the River. Likewise Hugh Davis was examined, upon Oath, in relation to the same Mills, and Quantity of Water. William Gregory examined, in like Manner, as to the disposing of Water by the New River Company. John Clerk was called, sworn, and examined as to any and what Scarcity of Water there is at Mr. Cowper's Mills; and declared, "That the Barges could not be got up in dry Seasons." Also, Richard Whitebread was examined, in like Manner, in relation to the Want of Water at the same Mills, the Reason thereof, and in what Seasons. Then John Leek, who had been a Barge-master 45 Years, was examined, as to the sparing of the Water through Manifold Ditch, and the Injury done in taking away the same. Likewise John Wilkins, another Barge-master for 50 Years, was examined also, upon Oath, in relation to the New River Company taking Water through the same Ditch, and the Inconveniency thereof. He was cross examined, as to a Commission of Sewers, and when the same subsisted; and if there was any, and what, Want of Water at that Time. And then William Willborn, who has known Manifold Ditch between 40 and 50 Years, was examined, in like Manner, as to the sparing or not sparing of Water through it, and the Effect the same had in relation to Barges. John Lethieullier produced a Copy of an Order of Council, dated 22d September, 1669; and attested upon Oath the same to be a true Copy, enjoining the New River Company to change the Bore of their Pipes in the River Lee from greater to lesser; and not to cause any Inundation on the Meadow Grounds adjoining. And the Counsel were directed to withdraw. Ordered, That the further Consideration of the said Bill be adjourned till To-morrow. Dominus Cancellarius declaravit præsens Parliamentum continuandum esse usque ad et in diem Mercurii, sextum diem instantis Junii, hora undecima Auroræ, Dominis sic decernentibus. Hodie 3a vice lecta est Billa, intituled, "An Act to enlarge the Powers of the Commissioners for building a Bridge cross the River Thames, from The Woollstaple or thereabouts, in the Parish of Saint Margaret, in the City of Westminster, to the opposite Shore, in the County of Surrey; and to enable them, by a Lottery, to raise Money for the several Purposes therein mentioned; and to enlarge the Time for exchanging Tickets unclaimed in the last Lottery for the said Bridge; and to make Provision for Tickets in the said Lottery, lost, burnt, or otherwise destroyed." 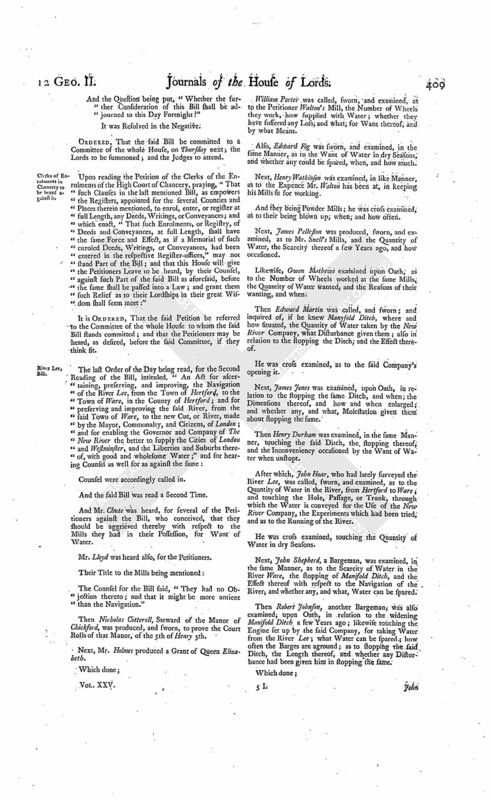 The Earl of Warwick reported from the Lords Committees appointed to consider of the Petition of Dame Mary Dinely, Wife of Sir John Dinely Baronet; praying, "That the £100. already lodged with the Clerk Assistant may be ordered to be paid the Petitioner's Solicitor; and that the said Sir John may be required to advance such further Sum of Money as shall be thought proper, to enable the Petitioner to satisfy her Witnesses for their Time and Expences, and pay her Solicitor for his Trouble and Fees, in assisting her to make her Defence to the Bill lately depending in this House, for dissolving the Marriage of Sir John Dinely with the Petitioner:" "That the Committee have met, and considered the Matter to them referred; and find that, on the 30th of April last, the Petitioner obtained an Order of this House, requiring Sir John Dinely to advance Money sufficient to procure Counsel and Solicitor to assist her in making her Defence to the said Bill, and for Payment of other Expences; in Pursuance of which Order, the Sum of £30. was lodged with the Clerk Assistant; which Sum has been since paid by the said Clerk to the Petitioner's Solicitor. "That, in Pursuance of another Order of the 10th of May last, the further Sum of £100. was lodged with the said Clerk Assistant, subject to the further Order of the House; which Sum is still remaining in the Hands of the said Clerk Assistant. "And the Committee think proper to acquaint the House, That Thomas Adamson, the Petitioner's Solicitor, delivered to their Lordships a Bill, containing the Particulars of what had been already paid by him, on account of the Petitioner's said Defence, amounting to the Sum of £126. 4s. 5d. 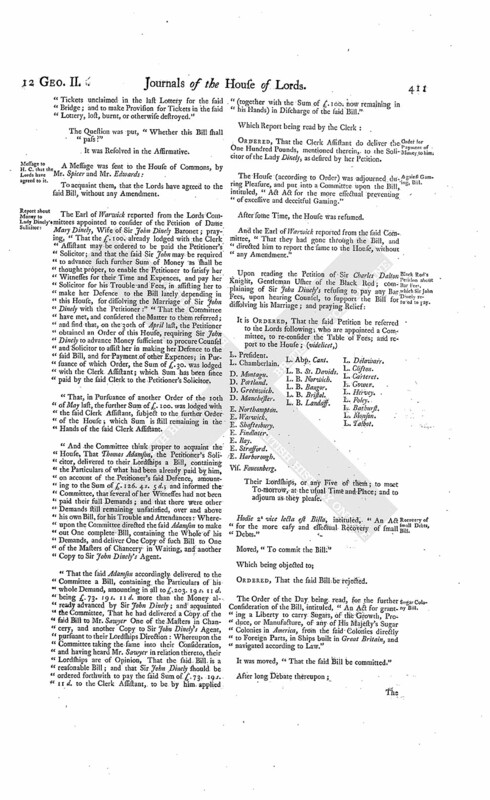 ; and informed the Committee, that several of her Witnesses had not been paid their full Demands; and that there were other Demands still remaining unsatisfied, over and above his own Bill, for his Trouble and Attendances: Whereupon the Committee directed the said Adamson to make out One complete Bill, containing the Whole of his Demands, and deliver One Copy of such Bill to One of the Masters of Chancery in Waiting, and another Copy to Sir John Dinely's Agent. "That the said Adamson accordingly delivered to the Committee a Bill, containing the Particulars of his whole Demand, amounting in all to £203. 19s. 11d. being £73. 19s. 11d. more than the Money already advanced by Sir John Dinely; and acquainted the Committee, That he had delivered a Copy of the said Bill to Mr. Sawyer One of the Masters in Chancery, and another Copy to Sir John Dinely's Agent, pursuant to their Lordships Direction: Whereupon the Committee taking the same into their Consideration, and having heard Mr. Sawyer in relation thereto, their Lordships are of Opinion, That the said Bill is a reasonable Bill; and that Sir John Dinely should be ordered forthwith to pay the said Sum of £. 73. 19s. 11d. to the Clerk Assistant, to be by him applied (together with the Sum of £100. now remaining in his Hands) in Discharge of the said Bill." Order for Payment of Money to him. Ordered, That the Clerk Assistant do deliver the One Hundred Pounds, mentioned therein, to the Solicitor of the Lady Dinely, as desired by her Petition. The House (according to Order) was adjourned during Pleasure, and put into a Committee upon the Bill, intituled, "An Act for the more effectual preventing of excessive and deceitful Gaming." Black Rod's Petition about Bar Fees, which Sir John Dinely refused to pay. L. B. Landaff. L. Delawarr. Hodie 2a vice lecta est Billa, intituled, "An Act for the more easy and effectual Recovery of small Debts." 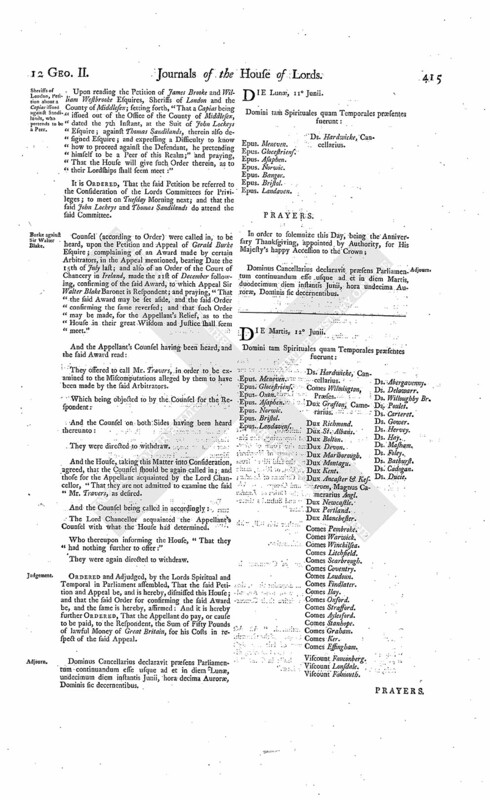 The Order of the Day being read, for the further Consideration of the Bill, intituled, "An Act for granting a Liberty to carry Sugars, of the Growth, Produce, or Manufacture, of any of His Majesty's Sugar Colonies in America, from the said Colonies directly to Foreign Parts, in Ships built in Great Britain, and navigated according to Law." It was moved, "That the said Bill be committed." Ordered, That the Bill be committed to a Committee of the whole House, on Friday next; and that the Commissioners of the Customs do then attend. Ordered, That the Cause wherein Gerald Burke Esquire is Appellant and Sir Walter Blake Baronet Respondent, which stands to be heard on that Day, be put off to Saturday next. Ordered, That the further Hearing of Counsel and Consideration of the Bill for improving the Navigation of the River Lee, which was appointed for this Day, be put off till To-morrow; and that the Counsel be called in at Twelve a Clock. Dominus Cancellarius declaravit præsens Parliamentum continuandum esse usque ad et in diem Jovis, septimum diem instantis Junii, hora undecima Auroræ, Dominis sic decernentibus. Hodie 3a vice lecta est Billa, intituled, "An Act for the more effectual preventing of excessive and deceitful Gaming." 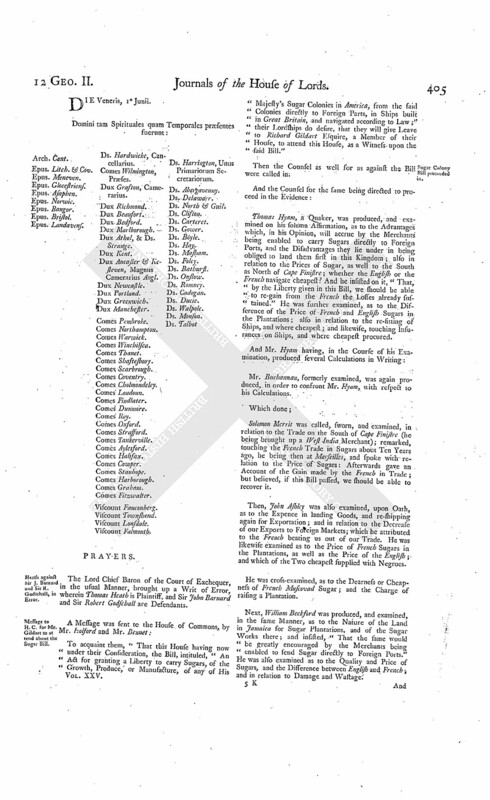 The Order of the Day being read, for the further Hearing of Counsel and Consideration of the Bill, intituled, "An Act for ascertaining, preserving, and improving, the Navigation of the River Lee, from the Town of Hertford, to the Town of Ware, in the County of Hertford; and for preserving and improving the said River, from the said Town of Ware, to the new Cut, or River, made by the Mayor, Commonalty, and Citizens, of London; and for enabling the Governor and Company of The New River the better to supply the Cities of London and Westminster, and the Liberties and Suburbs thereof, with good and wholesome Water." And Mr. Hollins was heard, upon the Petition of the Reverend Mr. John Lloyd, against the said Bill, who has a Suit in Chancery depending against the Governor and Company of The New River. And Part of an Act, of the 3d Year of King James the First, relating to the said River, was read. And called James Forder, who was sworn; and examined as to his Knowledge of the River Lee; and he acquainted the House, "He had known it 50 Years." And being further examined, as to the Condition it was in when a Commission of Sewers was subsisting in the Reign of His late Majesty; he declared, "It was then in good Condition." He was also examined as to Obstructions given to the Navigation, by throwing in Stones or Rubbish; also as to Flashes for the Use of the Barges, and the Prices paid for them; and in relation to the taking away Water by Waltham Mills, and as to the Company's taking Water from Manifold Ditch. He was cross examined, as to Hatches used to stop the Water at the Mills, the taking Money for Flashes, and how much more Water is taken away from Waltham Mills than formerly. Next, Thomas Petit, who has known the River 45 Years, was examined, in the same Manner, as to the Millers lately advancing the Price of Flashes, the Condition the River was in when the Commission of Sewers was in being, the Obstructions given to the Navigation by Rubbish or Stones; also touching the Quantity of Water taken by the Balance Engine, and whether the Money to be paid by the Company would not be of more Service to the Navigation than the Water so taken by the Engine, and in relation to the Water diverted from the River by the adjacent Mills. He was cross examined, in relation to what Complaints he had himself made against the Company, and when; and as to the Streams which furnish the Mills, and how much Water the Barges draw. Then Daniel Lambert Junior, a Barge-master, was sworn, and examined touching the Navigation of the River Lee, and the Obstructions thereto, and how occasioned; as to what is paid for Flashes; and the Impositions put on them by the Millers; and how long at a Time Barges have laid aground. He was cross examined, as to the Quantity of Water taken by the Company from Manifold Ditch, and in relation to his stopping the same. Also, Thomas Waller, who has known the River 40 Years, was examined upon Oath, as to Obstructions in the Navigation, and Exactions of the Millers; also in relation to the Barges being aground; and which, in his Opinion, is most preferable, to have the Money the Company are to pay, or keep the Water taken away by them. Next, John Hetteridge was examined in like Manner, as to the Navigation when he was employed to take Care of the River, of the Obstructions then given to it, and how at present the Navigation is; of the diverting the Water, in order to oblige the Barge-masters to pay for Flashes; and as to the throwing of Gravel into the River: And he acquainted the House, "He was One Night himself an Eye-witness of that Practice." Likewise, Thomas Richmond was examined, in the same Manner, to the same Purpose; and gave the like Account. And also, Dr. Desagulier was examined upon Oath, as to the Balance Engine at Manyfold Ditch, the Use thereof, and as to raising Water in the River Lee; and which, in his Opinion, was most beneficial, the Money the Company are to pay, or the Water they are to take. He was cross examined, as to the Gage of the Engine, the Quantity of Water issuing through in an Hour; and whether, when the Ditch is stopt, it is not advantageous to the Navigation. The Counsel for the Bill offered to produce Orders made by the Commissioners of Sewers, in relation to the Navigation. Mr. Chute and Mr. Lloyd heard severally, by Way of Reply. Dr. Desagulier was again called, and examined as to what Quantity of Water the Engine would convey into The New River, more than it had formerly. Ordered, That the House be put into a Committee thereupon, on Tuesday next; the Lords to be summoned; and the Judges then again to attend. Dominus Cancellarius declaravit præsens Parliamentum continuandum esse usque ad et in diem Veneris, octavum diem instantis Junii, hora undecima Auroræ, Dominis sic decernentibus. Report of Committee on Black Rod's Petition about Bar Fees. 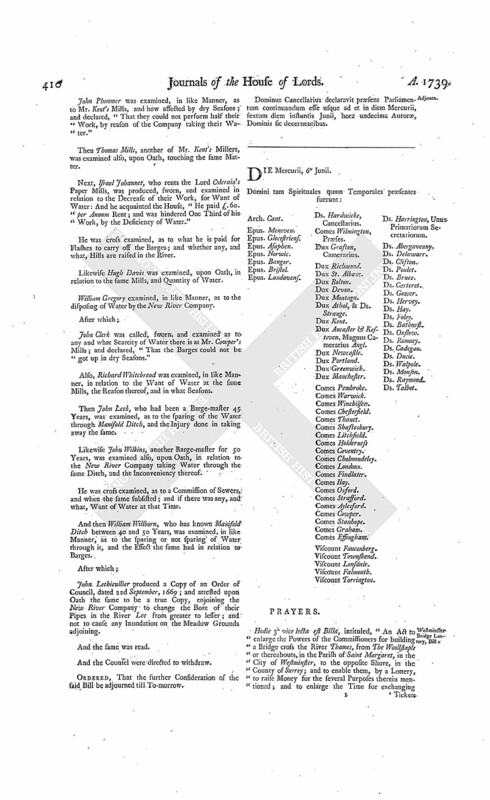 The Lord Delawarr reported from the Lords Committees appointed to re-consider the Table of Fees, with respect to the Petition of Sir Charles Dalton Knight, Gentleman Usher of the Black Rod; complaining of Sir John Dinely's refusing to pay any Bar Fees, upon the Hearing of Counsel to support the Bill for dissolving his Marriage; and praying Relief: "That the Committee have met, and considered the Matter to them referred; and are of Opinion, "That the same Fees should be taken, by the Officers of the House, upon the Hearing of Counsel for and against any Bill depending in this House, as are directed to be paid by the said Table of Fees upon the Hearing of Appeals." The House (according to Order) was adjourned during Pleasure, and put into a Committee upon the Bill, intituled, "An Act for ascertaining, preserving, and improving, the Navigation of the River Lee, from the Town of Hertford, to the Town of Ware, in the County of Hertford; and for preserving and improving the said River, from the said Town of Ware, to the new Cut, or River, made by the Mayor, Commonalty, and Citizens, of London; and for enabling the Governor and Company of The New River the better to supply the Cities of London and Westminster, and the Liberties and Suburbs thereof, with good and wholesome Water." And the Lord Delawarr reported from the said Committee, "That they had gone through the Bill, and made some Amendments thereunto; which should be ready to be reported, when the House will please to receive the same." Ordered, That the said Report be received To morrow. The House (according to Order) was adjourned during Pleasure, and put into a Committee upon the Bill, intituled, "An Act for granting a Liberty to carry Sugars, of the Growth, Produce, or Manufacture, of any of His Majesty's Sugar Colonies in America, from the said Colonies directly to Foreign Parts, in Ships built in Great Britain, and navigated according to Law." And the Earl of Warwick reported from the said Committee, "That they had gone through the Bill, and made some Amendments thereunto." Which he was directed to report, when the House will please to receive the same. Dominus Cancellarius declaravit præsens Parliamentum continuandum esse usque ad et in diem Sabbati, nonum diem instantis Junii, hora undecima Auroræ, Dominis sic decernentibus. The Earl of Warwick (according to Order) reported from the Committee of the whole House to whom the Bill, intituled, "An Act for ascertaining, preserving, and improving, the Navigation of the River Lee, from the Town of Hertford, to the Town of Ware, in the County of Hertford; and for preserving and improving the said River, from the said Town of Ware, to the new Cut, or River, made by the Mayor, Commonalty, and Citizens, of London; and for enabling the Governor and Company of The New River the better to supply the Cities of London and Westminster, and the Liberties and Suburbs thereof, with good and wholesome Water," was committed, the Amendments made by the Committee to the said Bill. Which, being read a Second Time, were, with an Amendment to One of them, agreed to by the House. 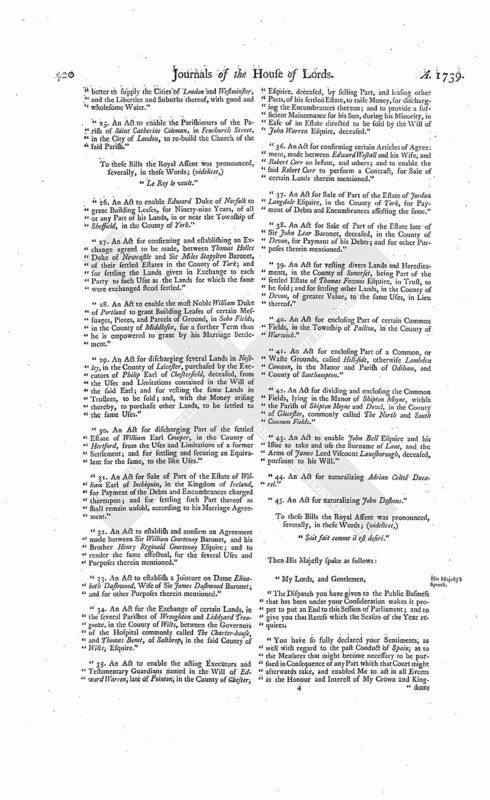 Report was also made from the Committee of the whole House to whom the Bill, intituled, "An Act for granting a Liberty to carry Sugars, of the Growth, Produce, or Manufacture, of any of His Majesty's Sugar Colonies in America, from the said Colonies directly to Foreign Parts, in Ships built in Great Britain, and navigated according to Law," was committed, of the Amendments made by the Committee to the said Bill. Which being read a Second Time, were, with Amendments to some of the said Amendments, agreed to by the House. Committee Privilege, on Price's Petition, to meet. The House being moved, "That the Lords Committees for Privileges, to whom was referred the Petition of James Price, One of the Clerks in the Parliamentoffice, who, on the 11th of May last, was served, by one John Thomas, with a Copy of an Attachment of Privilege, at the Suit of Edward Haryes, One of the Attornies of the Court of Common Pleas at Westminster, by leaving the same with the Petitioner, then actually employed in the said Office, praying the Consideration of the House, may meet on Tuesday Morning next:"
It is Ordered, That the said Committee do meet, on Consideration of the said Petition, on Tuesday next; and that the said John Thomas and Edward Haryes do then attend the said Committee. Sheriffs of London, Petition about a Capias issued against Sandilands, who pretends to be a Peer. Upon reading the Petition of James Brooke and William Westbrooke Esquires, Sheriffs of London and the County of Middlesex; setting forth, "That a Capias being issued out of the Office of the County of Middlesex, dated the 7th Instant, at the Suit of John Lockeys Esquire; against Thomas Sandilands, therein also designed Esquire; and expressing a Difficulty to know how to proceed against the Defendant, he pretending himself to be a Peer of this Realm;" and praying, That the House will give such Order therein, as to their Lordships shall seem meet:"
It is Ordered, That the said Petition be referred to the Consideration of the Lords Committees for Privileges; to meet on Tuesday Morning next; and that the said John Lockeys and Thomas Sandilands do attend the said Committee. 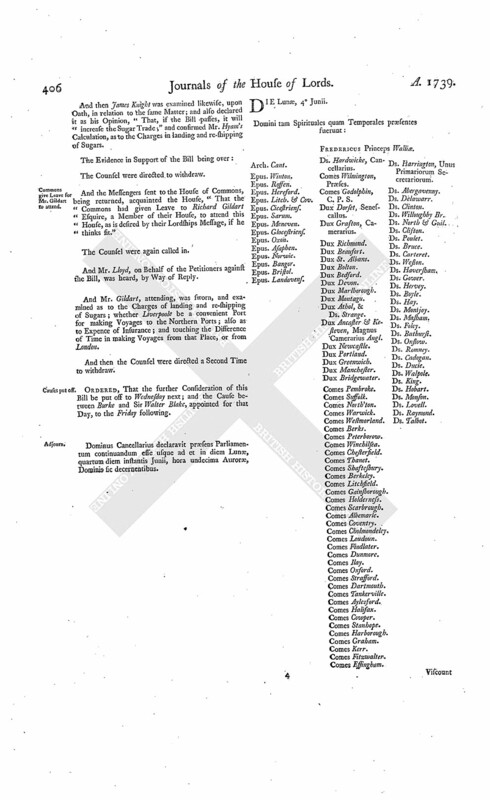 Counsel (according to Order) were called in, to be heard, upon the Petition and Appeal of Gerald Burke Esquire; complaining of an Award made by certain Arbitrators, in the Appeal mentioned, bearing Date the 15th of July last; and also of an Order of the Court of Chancery in Ireland, made the 21st of December following, confirming of the said Award, to which Appeal Sir Walter Blake Baronet is Respondent; and praying, "That the said Award may be set aside, and the said Order confirming the same reversed; and that such Order may be made, for the Appellant's Relief, as to the House in their great Wisdom and Justice shall seem meet." They offered to call Mr. Travers, in order to be examined to the Miscomputations alleged by them to have been made by the said Arbitrators. And the House, taking this Matter into Consideration, agreed, that the Counsel should be again called in; and those for the Appellant acquainted by the Lord Chancellor, "That they are not admitted to examine the said Mr. Travers, as desired. The Lord Chancellor acquainted the Appellant's Counsel with what the House had determined. Who thereupon informing the House, "That they had nothing further to offer:"
They were again directed to withdraw. Ordered and Adjudged, by the Lords Spiritual and Temporal in Parliament assembled, That the said Petition and Appeal be, and is hereby, dismissed this House; and that the said Order for confirming the said Award be, and the same is hereby, affirmed: And it is hereby further Ordered, That the Appellant do pay, or cause to be paid, to the Respondent, the Sum of Fifty Pounds of lawful Money of Great Britain, for his Costs in respect of the said Appeal. Dominus Cancellarius declaravit præsens Parliamentum continuandum esse usque ad et in diem Lunæ, undecimum diem instantis Junii, hora decima Auroræ, Dominis sic decernentibus. Dominus Cancellarius declaravit præsens Parliamentum continuandum esse usque ad et in diem Martis, duodecimum diem instantis Junii, hora undecima Auroræ, Dominis sic decernentibus. Thanks to the Bishop of St. Asaph, for his Sermon. Ordered, That the Thanks of this House be, and are hereby, given to the Lord Bishop of St. Asaph, for the Sermon by him preached before this House, Yesterday, in the Abbey Church, Westminster; and he is hereby desired to cause the same to be printed and published. 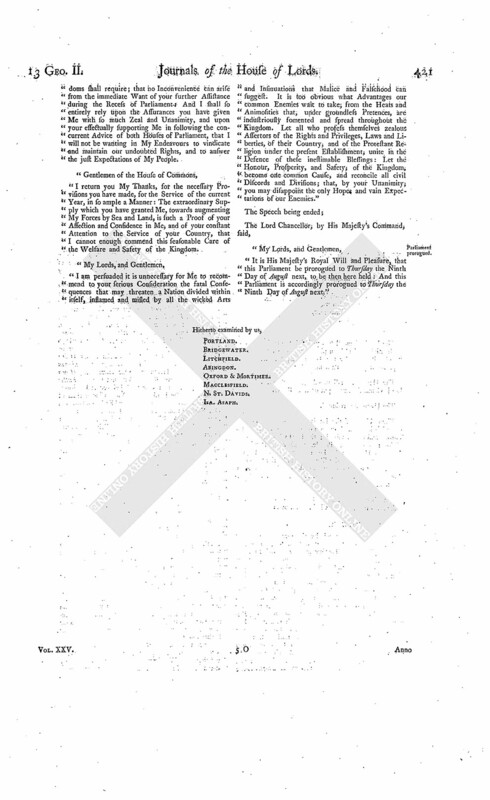 Report Committee on Petition of Sheriffs of London, about a Capias issued against Sandilands. The Earl of Warwick reported from the Lords Committees for Privileges, to whom was referred the Petition of James Brooke and William Westbrooke Esquires, Sheriffs of London and the County to Middlesex; setting forth, "That a Capias being issued out of the Office of the County of Middlesex, the 7th Instant, against Thomas Sandilands, therein designed Esquire; and expressing a Difficulty as to proceeding against the Defendant, he pretending himself to be a Peer of Great Britain;" and praying, "That the House will give such Order therein as to their Lordships shall seem meet:" "That the Committee had met, on Consideration of the said Petition; and were attended by the said Defendant; and, having heard him touching the Matter of the said Petition, are of Opinion, That no Cause has been shewn to the Committee, why the Petitioners should not proceed in the Execution of the Process directed to them, mentioned in their Petition." List of Peers of Scotland to be laid before the House. 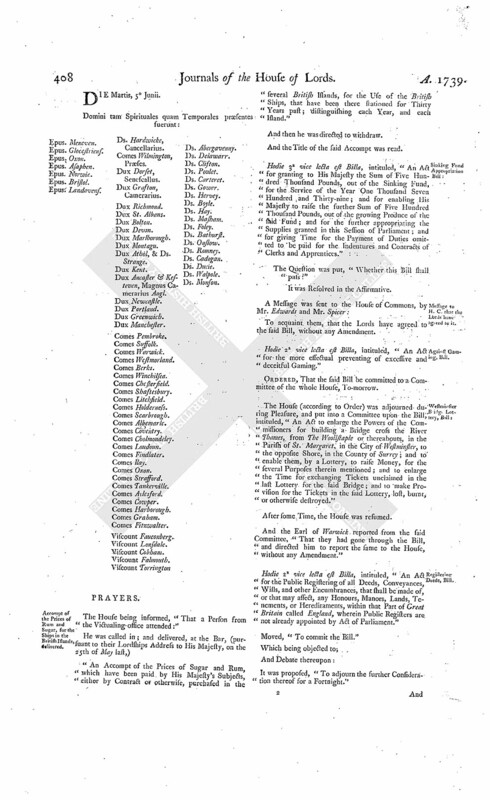 Ordered, That the Lords of Session in Scotland do make up a Roll, or List, of the Peers of Scotland, at the Time of the Union, whose Peerages are still continuing, and do lay the same before this House in the next Session of Parliament; and that the said Lords do, as far as they shall be able, state, in such Roll or List, the particular Limitations of such Peerages. Hodie 3a vice lecta est Billa, intituled, "An Act for ascertaining, preserving, and improving, the Navigation of the River Lee, from the Town of Hertford, to the Town of Ware, in the County of Hertford; and for preserving and improving the said River, from the said Town of Ware, to the new Cut, or River, made by the Mayor, Commonalty, and Citizens of London; and for enabling the Governor and Company of The New River the better to supply the Cities of London and Westminster, and the Liberties and Suburbs thereof, with good and wholesome Water." Hodie 3a vice lecta est Billa, intituled, "An Act for granting a Liberty to carry Sugars, of the Growth, Produce, or Manufacture, of any of His Majesty's Sugar Colonies in America, from the said Colonies, directly to Foreign Parts, in Ships built in Great Britain, and navigated according to Law." A Message was sent to the House of Commons, by the former Messengers, to the like Purpose as the former Message. The Order being read, for the House to be in a Committee upon the Bill, intituled, "An Act for the public Registering of all Deeds, Conveyances, Wills, and other Encumbrances, that shall be made of, or that may affect, any Honours, Manors, Lands, Tenements, or Hereditaments, within that Part of Great Britain called England, wherein public Registers are not already appointed by Act of Parliament;" and to hear Counsel, upon the Petition of the Clerks of the Enrolments of the High Court of Chancery, against several Clauses in the said Bill, which empower the enroling at full Length any Deeds, Writings, or Conveyances:"
Sydenham Maltus, Charles Boucher, Henry Trubshaw, and Stephen Downes, were called in, and sworn, in order to be examined before the said Committee, upon the said Petition. The House accordingly was adjourned during Pleasure, and put into a Committee on the said Bill. Ordered, That the House be put into a Committee again on the said Bill, on this Day Fortnight. Judges to prepare a general Register Bill. Ordered, That the Judges, do prepare and bring in a Bill the next Session of Parliament, for the public Registering of Deeds, Conveyances, and Encumbrances, that shall be made of, or that may affect, any Honours, Manors, Lands, Tenements, or Hereditaments, within that Part of Great Britain called England, wherein public Registers are not already appointed by Act of Parliament. Dominus Cancellarius declaravit præsens Parliamentum continuandum esse usque ad et in diem Mercurii, decimum tertium diem instantis Junii, hora undecima Auroræ, Dominis sic decernentibus. It is Ordered, That the Petitioner be at Liberty to amend his said Appeal, as desired. Message from H. C. to return River Lee Bill. To return the Bill, intituled, "An Act for ascertaining, preserving, and improving, the Navigation of the River Lee, from the Town of Hertford, to the Town of Ware, in the County of Hertford; and for preserving and improving the said River, from the said Town of Ware, to the new Cut, or River, made by the Mayor, Commonalty, and Citizens of London; and for enabling the Governor and Company of The New River the better to supply the Cities of London and Westminster, and the Liberties and Suburbs thereof, with good and wholesome Water;" and to acquaint this House, that they have agreed to their Lordships Amendments made thereto. Napper to revive E. Fingall's Appeal. Upon reading the Petition of James Lenox Napper and William Napper Esquires, Respondents to the Appeal of Robert Plunket Esquire, commonly called Earl of Fingall, and others; praying, "In regard the said Appellant is dead, that the Petitioners may be at Liberty to revive the Cause in the Court of Chancery in Ireland; and that the Son and Heir of the said Appellant may be obliged to revive the said Appeal, within such Time as the House shall think proper:"
It is Ordered, That the Petitioners be at Liberty to revive the said Cause, in the said Court of Chancery, as desired. Message from H. C. to return Sugar Colony Bill. To return the Bill, intituled, "An Act for granting a Liberty to carry Sugars, of the Growth, Produce, or Manufacture, of any of His Majesty's Sugar Colonies in America, from the said Colonies directly to Foreign Parts, in Ships built in Great Britain, and navigated according to Law;" and to acquaint this House, that they have agreed to their Lordships Amendments made thereto. Ordered, That an humble Address be presented to His Majesty, "That He will be graciously pleased to give Directions to the proper Officer, that an Accompt be prepared, and laid before this House at their next Sessions, at what Rates all Gold and Silver Coins were accompted, received, taken, or paid, and Gold and Silver were purchased at, or sold for, per Ounce, in any of the British Colonies and Plantations in America, in the Years 1700, 1710, 1720, 1730; and at what Rates Gold and Silver Coins are accompted, received, taken, or paid, and Gold and Silver are purchased at, or sold for, per Ounce, at this Time, in such Colonies and Plantations, distinguishing each Colony and Plantation." Also for an Account of Paper Bills, or Bills of Credit there. "And also, that an Accompt be prepared, and laid before this House, at their next Sessions, what was the Amount of the Paper Bills, or Bills of Credit, which, by virtue of any Act or Acts of Assembly, subsisted or passed in Payment in any of the British Colonies or Plantations, in the Year 1700; and also an Accompt of the Amount of what Paper Bills, or Bills of Credit, of any Species or Kinds, have, by virtue of any Act or Acts, been created or issued, in any of the said Colonies or Plantations, since the Year 1700; with the Amount of the Value in Money of Great Britain of such Bills, at the respective Times of their creating and issuing, and what Provision was made thereby for the sinking or discharging of any such Paper Bills, or Bills of Credit; together with an Accompt of the Amount of the Bills that have been sunk, or discharged, in Pursuance thereof; and also of the Bills subsisting or passing in Payment at this Time, in any of the said Colonies and Plantations, with the Amount of the Value in Money of Great Britain of such Bills; distinguishing each Species or Kind of Paper Bills, or Bills of Credit, and each Colony or Plantation." Dominus Cancellarius declaravit præsens Parliamentum continuandum esse usque ad et in diem Jovis, decimum quartum diem instantis Junii, hora undecima Auroræ, Dominis sic decernentibus. Gore against Whitlaw et al. 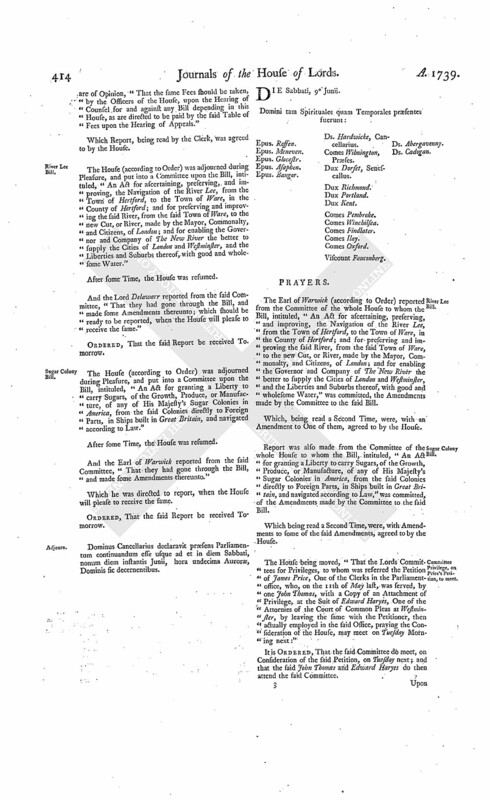 The joint and several Answer of Alice Whitlaw Widow, and Henry Donelly, to the Appeal of Dame Letitia Gore, Widow of Sir Nathaniel Gore, and others, was brought in. His Majesty's Answer to Address about the Rates of Coins in the British Colonies. The Lord Steward reported, "That the Lords with White Staves had (according to Order) presented to His Majesty the Address of this House Yesterday, That He would be pleased to give Directions to the proper Officers, that an Accompt be prepared, and laid before this House at their next Sessions, at what Rates all Gold and Silver Coins were current, and Gold and Silver were purchased at, or sold for, per Ounce, in any of the British Colonies and Plantations in America; and also an Accompt of what was the Amount of the Paper Bills, or Bills of Credit, passed in Payment in any of the said Colonies and Plantations, in several Years in the Address mentioned; and that His Majesty was pleased to say, "He will give Directions, that the Accompts desired be prepared, and laid before this House, accordingly." "1. An Act for granting to His Majesty the Sum of Five Hundred Thousand Pounds, out of the Sinking Fund, for the Service of the Year One Thousand Seven Hundred and Thirty-nine; and for enabling His Majesty to raise the further Sum of Five Hundred Thousand Pounds, out of the growing Produce of the said Fund; and for the further appropriating the Supplies granted in this Session of Parliament; and for giving Time for the Payment of Duties omitted to be paid for the Indentures and Contracts of Clerks and Apprentices." "2. An Act to enable His Majesty to settle an Annuity of Fifteen Thousand Pounds on his Royal Highness the Duke of Cumberland and the Heirs of his Body; and also One other Annuity of Twenty-four Thousand Pounds on their Royal Highnesses the Princess Amelie, the Princess Caroline, the Princess Mary, and the Princess Lovisa." "3. An Act for taking off the Duties upon Woollen and Bay Yarn imported from Ireland to England; and for the more effectual preventing the Exportation of Wool from Great Britain, and of Wool and Wool manufactured from Ireland to Foreign Parts." "4. An Act for granting a Liberty to carry Sugars, of the Growth, Produce, or Manufacture, of any of His Majesty's Sugar Colonies in America, from the said Colonies directly to Foreign Parts, in Ships built in Great Britain, and navigated according to Law." "5. An Act for the more effectual preventing of excessive and deceitful Gaming." "6. An Act for the better preventing Frauds and Abuses in Gold and Silver Wares." "7. An Act for prohibiting the Importation of Books re-printed Abroad, and first composed, or written, and printed, in Great Britain; and for repealing so much of an Act, made in the Eighth Year of the Reign of Her late Majesty Queen Anne, as empowers the limiting the Prices of Books." "8. An Act to rectify a Mistake in an Act made in the Sixth Year of the Reign of His late Majesty King George, for preventing Frauds and Abuses in the Public Revenues of Excise, Customs, Stamp Duties, Post-office, and House-money, relating to the Condition of Bonds taken from Masters of Ships; and to indemnify Persons who have acted under the said Mistake; and also to obviate a Doubt which has arisen, upon an Act made in the Seventh Year of His said late Majesty's Reign, for the further preventing His Majesty's Subjects from trading to The East Indies under Foreign Commissions; and for encouraging and further securing the lawful Trade thereto; with regard to Prosecutions in Ireland, in a summary Way, for the fraudulent Importation of East India Goods into that Kingdom." "9. An Act for explaining and amending an Act, made in the Eighth Year of the Reign of King Richard the Second, intituled, "No Man of Law shall be Justice of Assize or Gaol Delivery in his own Country;" and another Act, made in the Thirty-third Year of the Reign of King Henry the Eighth, intituled, "An Act that none shall be Justice of Assize in his own Country, &c."
"10. An Act for continuing the Act made in the Eighth Year of the Reign of Her late Majesty Queen Anne, to regulate the Price and Assize of Bread; and for continuing, explaining, and amending, the Act made in the Second Year of the Reign of His present Majesty, for the better Regulation of Attornies and Solicitors." "11. An Act for allowing further Time for Enrolment of Deeds and Wills made by Papists; and for Relief of Protestant Purchasers, Devisees, and Lessees." "12. An Act for the more easy assessing, collecting, and levying, of County Rates." "13. An Act to empower the High Court of Chancery to lay out, upon proper Securities, any Monies, not exceeding a Sum therein limited, out of the common and general Cash in the Bank of England, belonging to the Suitors of the said Court, for the Ease of the said Suitors, by applying the Interest arising therefrom for answering the Charges of the Office of the Accomptant General of the said Court." "14. An Act to obviate some Doubts which have arisen, upon the construction of an Act, made in the First Year of the Reign of King William and Queen Mary, intituled, "An Act for explaining Part of an Act made in the First Year of the Reign of King James the First, concerning Tanned Leather;" and for rendering more effectual a Clause in the said last mentioned Act, which obliges Curriers to curry Leather; and for repealing Two Clauses in the said last mentioned Act." "15. An Act for providing a Reward to Joanna Stephens, upon a proper Discovery to be made by her, for the Use of the Public, of the Medicines prepared by her for the Cure of the Stone." "16. 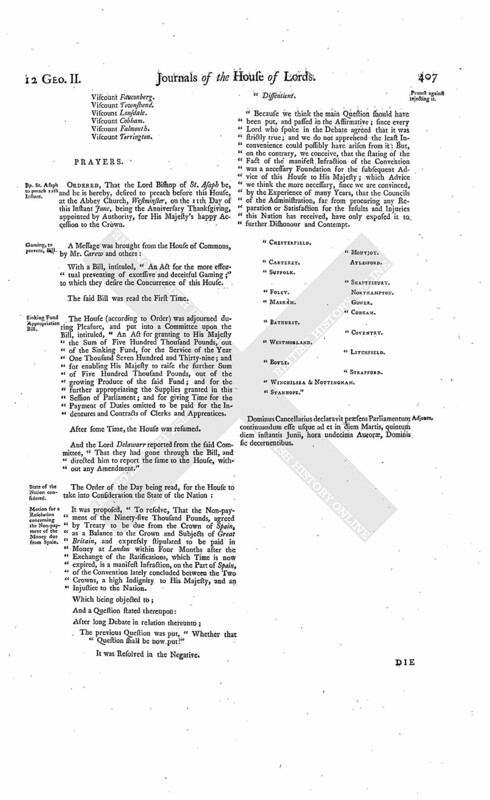 An Act to enlarge the Powers of the Commissioners for building a Bridge cross the River Thames, from The Woolstaple, or thereabouts, in the Parish of Saint Margaret, in the City of Westminster, to the opposite Shore, in the County of Surrey; and to enable them, by a Lottery, to raise Money, for the several Purposes therein mentioned; and to enlarge the Time for exchanging Tickets unclaimed in the last Lottery for the said Bridge; and to make Provision for Tickets in the said Lottery, lost, burnt, or otherwise destroyed." "17. An Act for establishing and well-governing an Hospital, or Infirmary, in the City of Bath." "18. 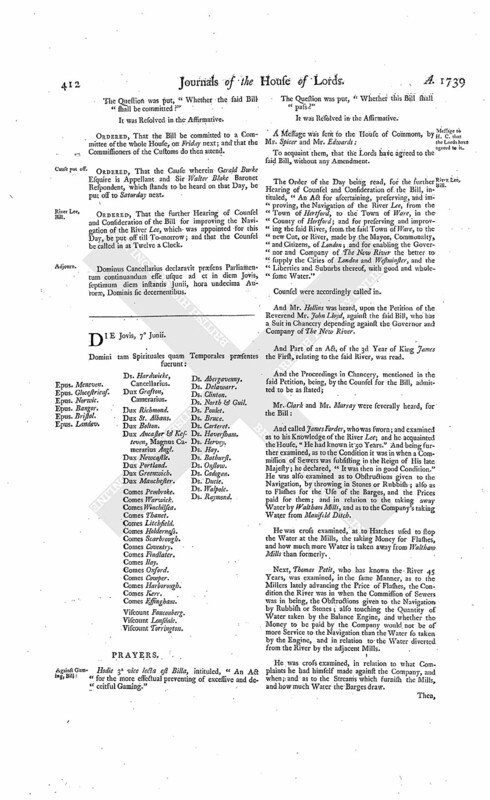 An Act for enlarging the Term and Powers granted by an Act passed in the Eighth Year of the Reign of His late Majesty King George the First, for amending the Highways leading from Brampton Bridge to Welford Bridge, in the County of Northampton; and also the great Post Road from Morter-Pitt Hill, in the said County, through Brixworth, Lamport, Maidwell, Kelmarsh, and Oxenden-Magna, to Chain Bridge, leading into Market Harborough, in the County of Leicester." "19. 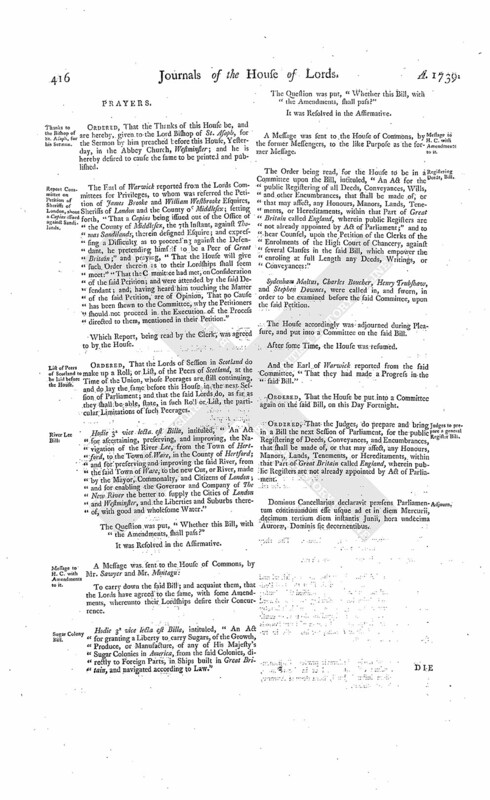 An Act for enlarging the Term and Powers granted by an Act passed in the First Year of the Reign of His present Majesty, intituled, An Act for repairing the Road from the Powder Mills on Hounslow Heath, in the County of Midalesex, to a Place called Basingstone, near the Town of Bagshot; in the Parish of Windlesham, in the County of Surrey." "20. An Act for enlarging the Term and Powers granted by an Act passed in the Twelfth Year of the Reign of His late Majesty King George the First, for repairing the Road from Spittlegate Hill, near Grontham, in the County of Lincoln, to Little Drayton, in the County of Nottingham." "21. 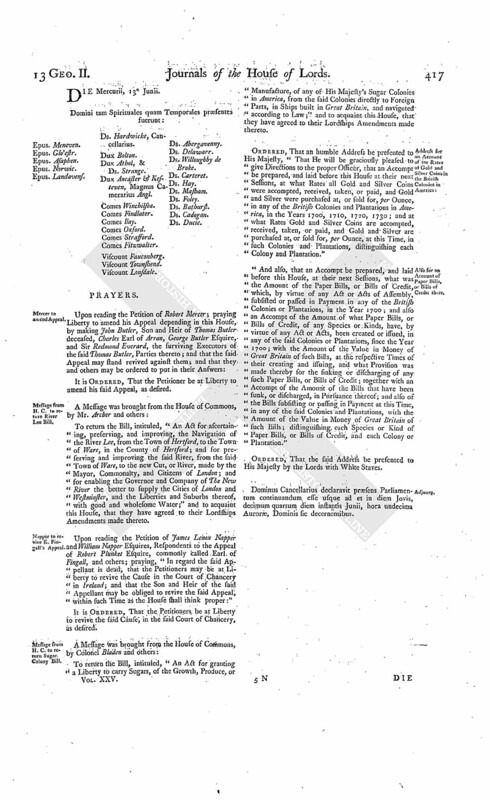 An Act for enlarging the Term and Powers granted by Two Acts of Parliament, one made in the Sixth Year of the Reign of Her late Majesty Queen Anne, and the other in the Seventh Year of the Reign of His late Majesty King George the First, for repairing and enlarging the Highways, between the Top of Kingsdown Hill and the City of Bath; and for amending several other Highways leading to the said City; and for cleansing, paving, and enlightening the Streets, and regulating the Chairmen there; and for keeping a regular Nightly Watch within the said City and Liberties thereof." "22. An Act for repairing the Road, or Highway, from The Dun Cow, in the Town of Dunchurch, through the Parish of Bilton, over Dunsmore Heath, to the Town of Hill Morton, in the County of Warwick; and from thence, through the several Parishes of Creek, West Haddon, and East Haddon, in the County of Northampton, to Saint James's End, in the Parish of Duston, in the said County of Northampton." "23. An Act for repairing the Roads from Bakewell to Chesterfield, in the County of Derby; and from Chesterfield to Worksopp, in the County of Nottingham; and from Chesterfield, to the Place where the Northern Road meets the Chesterfield Road which leads to Mansfield, in the said County of Nottingham." "24. An Act for ascertaining, preserving, and improving, the Navigation of the River Lee, from the Town of Hertford, to the Town of Ware, in the County of Hertford; and for preserving and improving the said River, from the said Town of Ware, to the new Cut, or River, made by the Mayor, Commonalty, and Citizens of London; and for enabling the Governor and Company of The New River the better to supply the Cities of London and Westminster, and the Liberties and Suburbs thereof, with good and wholesome Water." "25. An Act to enable the Parishioners of the Parish of Saint Catherine Coleman, in Fenchurch Street, in the City of London, to re-build the Church of the said Parish." "26. An Act to enable Edward Duke of Norfolk to grant Building Leases, for Ninety-nine Years, of all or any Part of his Lands, in or near the Township of Sheffield, in the County of York." "27. An Act for confirming and establishing an Exchange agreed to be made, between Thomas Holles Duke of Newcastle and Sir Miles Stapylton Baronet, of their settled Estates in the County of York; and for settling the Lands given in Exchange to each Party to such Uses as the Lands for which the same were exchanged stood settled." "28. An Act to enable the most Noble William Duke of Portland to grant Building Leases of certain Messuages, Pieces, and Parcels of Ground, in Soho Fields, in the County of Middlesex, for a further Term than he is empowered to grant by his Marriage Settlement." "29. An Act for discharging several Lands in Noseley, in the County of Leicester, purchased by the Executors of Philip Earl of Chesterfield, deceased, from the Uses and Limitations contained in the Will of the said Earl; and for vesting the same Lands in Trustees, to be sold; and, with the Money arising thereby, to purchase other Lands, to be settled to the same Uses." "30. An Act for discharging Part of the settled Estate of William Earl Cowper, in the County of Hertford, from the Uses and Limitations of a former Settlement; and for settling and securing an Equivalent for the same, to the like Uses." "31. An Act for Sale of Part of the Estate of William Earl of Inchiquin, in the Kingdom of Ireland, for Payment of the Debts and Encumbrances charged thereupon; and for settling such Part thereof as shall remain unsold, according to his Marriage Agreement." "32. An Act to establish and confirm an Agreement made between Sir William Courtenay Baronet, and his Brother Henry Reginald Courtenay Esquire; and to render the same effectual, for the several Uses and Purposes therein mentioned." "33. An Act to establish a Jointure on Dame Elizabeth Dashwood, Wife of Sir James Dashwood Baronet; and for other Purposes therein mentioned." "34. An Act for the Exchange of certain Lands, in the several Parishes of Wroughton and Liddyard Treagooze, in the County of Wilts, between the Governors of the Hospital commonly called The Charter-house, and Thomas Benet, of Salthrop, in the said County of Wilts, Esquire." "35. 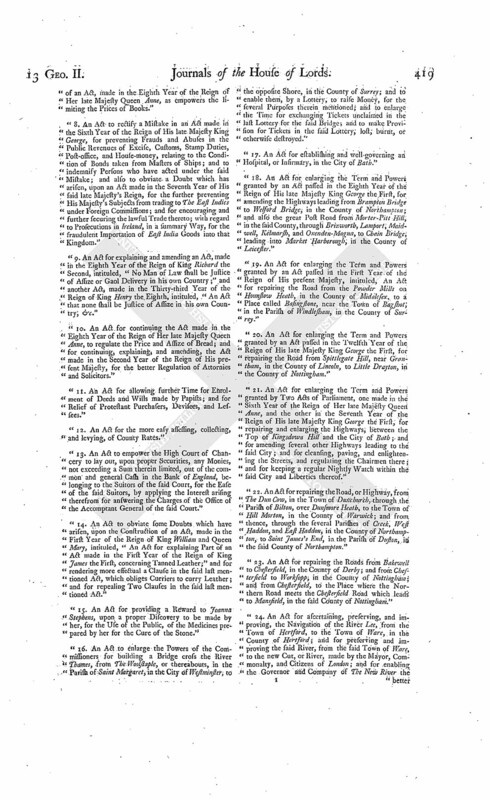 An Act to enable the acting Executors and Testamentary Guardians named in the Will of Edward Warren, late of Pointon, in the County of Chester, Esquire, deceased, by selling Part, and leasing other Parts, of his settled Estate, to raise Money, for discharging the Encumbrances thereon; and to provide a sufficient Maintenance for his Son, during his Minority, in Ease of an Estate directed to be sold by the Will of John Warren Esquire, deceased." "36. An Act for confirming certain Articles of Agreement, made between Edward Westall and his Wife, and Robert Corr an Infant, and others; and to enable the said Robert Corr to perform a Contract, for Sale of certain Lands therein mentioned." "37. An Act for Sale of Part of the Estate of Jordan Langdale Esquire, in the County of York, for Payment of Debts and Encumbrances affecting the same." "38. An Act for Sale of Part of the Estate late of Sir John Lear Baronet, deceased, in the County of Devon, for Payment of his Debts; and for other Purposes therein mentioned." "39. An Act for vesting divers Lands and Hereditaments, in the County of Somerset, being Part of the settled Estate of Thomas Fownes Esquire, in Trust, to be sold; and for settling other Lands, in the County of Devon, of greater Value, to the same Uses, in Lieu thereof." "40. An Act for enclosing Part of certain Common Fields, in the Township of Pailton, in the County of Warwick." "41. An Act for enclosing Part of a Common, or Waste Grounds, called Hill-side, otherwise Lambden Common, in the Manor and Parish of Odiham, and County of Southampton." "42. An Act for dividing and enclosing the Common Fields, lying in the Manor of Shipton Moyne, within the Parish of Shipton Moyne and Dovel, in the County of Glocester, commonly called The North and South Common Fields." "43. An Act to enable John Bell Esquire and his Issue to take and use the Surname of Lane, and the Arms of James Lord Viscount Lanesborough, deceased, pursuant to his Will." "44. An Act for naturalizing Adrian Colteé Ducarel." "45. An Act for naturalizing John Deshons." "The Dispatch you have given to the Public Business that has been under your Consideration makes it proper to put an End to this Session of Parliament; and to give you that Recess which the Season of the Year requires. "You have so fully declared your Sentiments, as well with regard to the past Conduct of Spain; as to the Measures that might become necessary to be pursued in Consequence of any Part which that Court might afterwards take, and enabled Me to act in all Events as the Honour and Interest of My Crown and King doms shall require; that no Inconvenience can arise from the immediate Want of your further Assistance during the Recess of Parliament: And I shall so entirely rely upon the Assurances you have given Me with so much Zeal and Unanimity, and upon your effectually supporting Me in following the concurrent Advice of both Houses of Parliament, that I will not be wanting in My Endeavours to vindicate and maintain our undoubted Rights, and to answer the just Expectations of My People. "I return you My Thanks, for the necessary Provisions you have made, for the Service of the current Year, in so ample a Manner: The extraordinary Supply which you have granted Me, towards augmenting My Forces by Sea and Land, is such a Proof of your Affection and Confidence in Me, and of your constant Attention to the Service of your Country, that I cannot enough commend this seasonable Care of the Welfare and Safety of the Kingdom. "I am persuaded it is unnecessary for Me to recommend to your serious Consideration the fatal Consequences that may threaten a Nation divided within itself, inflamed and misled by all the wicked Arts and Insinuations that Malice and Falsehood can suggest. It is too obvious what Advantages our common Enemies wait to take, from the Heats and Animosities that, under groundless Pretences, are industriously fomented and spread throughout the Kingdom. Let all who profess themselves zealous Assertors of the Rights and Privileges, Laws and Liberties, of their Country, and of the Protestant Religion under the present Establishment, unite in the Defence of these inestimable Blessings: Let the Honour, Prosperity, and Safety, of the Kingdom, become one common Cause, and reconcile all civil Discords and Divisions; that, by your Unanimity, you may disappoint the only Hopes and vain Expectations of our Enemies." "It is His Majesty's Royal Will and Pleasure, that this Parliament be prorogued to Thursday the Ninth Day of August next, to be then here held: And this Parliament is accordingly prorogued to Thursday the Ninth Day of August next."